SearchMyFiles is a powerful alternative to the standard Windows search. It allows you to easily find files by wildcard, last modified/created/last accessed time, file attributes, content (text or binary search), and file size. The program is non-indexing, meaning it searches the drive directly, which is often slower but more accurate. 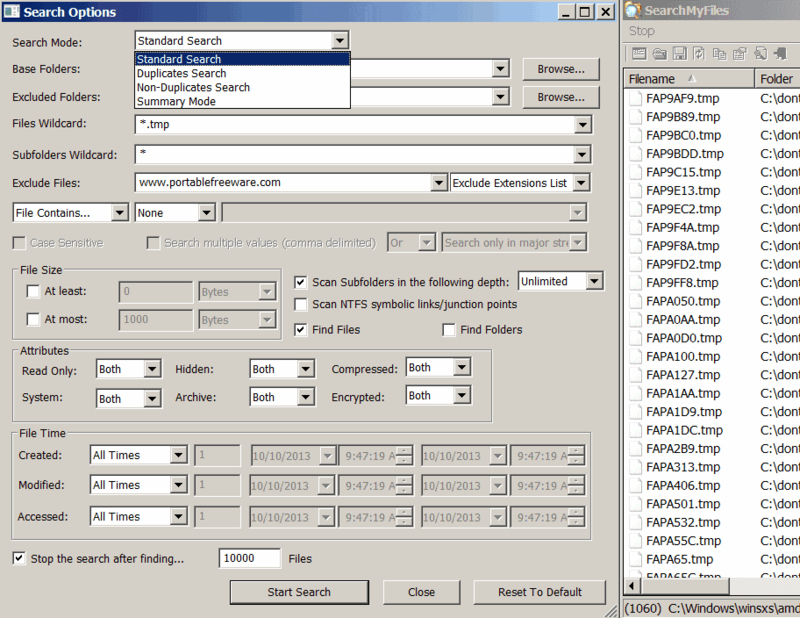 Can also be used to detect duplicate files via the "Search Mode" drop-down box. How to extract: Download the ZIP package and extract to a folder of your choice. Launch SearchMyFiles.exe. Added 'Duplicate Mark Color Set' (under the Options menu). You can choose 'Color Set 2' to mark the duplicate files with darker colors. I have tried and used several search apps before and was not very impressed but as soon as I saw that this product was from NirSoft I knew I had to try it. NirSoft makes so many great apps that I use a lot, its difficult to say something new about them due to the fact that just about everything they make works great and is pretty awesome overall. One thing is 4sure the native Micro$oft search engine is close to worthless, so just about anything will be an improvement. Anything from NirSoft is going to be awesome. I blocked access to these files and it started up OK and appeared to function normally. I was using 64-bit Version 2.40 on Windows 7. Does anyone know what it was trying to do? Well ive used pcs since dos 3.3, and ill be buggered if I can get this to work. Set a simple search and it took around 6 minutes to show files that had no connection to the search requirement. Ultra file search lite found the files asked for in the blink of an eye. Sorry but I must be stupid. this app is pretty impressive. my operating system is 64-bit, and ran into many problems with other so-called 'search' software that were unable to search x64 files. this is the only search software that actually worked for me. Another annoying instance of the 64-bit executable (inside the differently named zip file) having the same name as the 32-bit executable. Is the file 64-bit, or 32-bit? @derty2 Since Windows does all kinds of indexing and caching of HD scans it is usual for the second run of any program to be much faster than the first. The proper way to compare the performance of such programs is to do a restart between tests. I ran a comparison test of this program VS the well known "Agent Ransack". I searched all (*.txt) text files inside an 800 GB folder, looking for the words "their next album". Agent Ransack found two files (which is correct, there were only two text files with that string). The results came up after about 20 seconds. Then I tried the same thing with "SearchMyFiles" ...The (correct) results popped up faster than I could take a few breaths; Amazing !! Note The screen shot shown here is way out of date (as is the image on the NirSoft site) with many of the recent improvements are not shown. Be careful when searching for "cmd" or "bat" files. If you open them using the "Open With" option and you select a text editor, next time you double click on a "cmd" or "bat" in the windows explorer the file is opened again with the text editor. For Just Art-just read the help file contained in the zip folder. The best Windows search I have found. I use it tio index my CD/DVD/hard drives and flash drives and keep them in a searchable folder -great. I use many of Nir Sofer's utilities and have yet to find one that I didn't think was fantastic, SearchMyFiles included. Thanks again, Nir ! ! One other note: can search the internals of files much better than Windows Search. I've used them side-by-side and SearchMyFiles found text that Windows Search couldn't. It makes me wonder over the years how many times I gave up on trying to find a file that was right in front of me. Not as good as a free program called "WildReplace" but this is ok. Finally, a simple and straightforward interface to a Search program. I've been looking for something like this ever since Microsoft turned their search into a horribly mangled train wreck in Vista. I do have a couple of minor nitpicky complaints. First, it uses two windows. If you cancel the search from the settings window, you still have to close the Search window. Second, it would be nice if it supported drag-and-drop from Windows Explorer to determine the folder to search in. Third, it always saves the settings from your last search. It doesn't give you a choice. I got around that by setting the .cfg file to read-only. None of these is enough to ruin it for me though. Excellent find for me! I can finally use this to export a directory listing of my unicode-named files. This should be categorised under the Directory Listing category as none of those there supports Unicode! A power-user search tool that doesn't require indexing, SearchMyFiles allows for extremely customized searches of your computer for very specific information. Much more detailed and customized versus other scanning programs available here on the site. Very useful, very effective software light years ahead of Windows own painfully stupid file-finding software. With this and Everything (http://www.portablefreeware.com/?id=1479) you can find anything. I have no freakin' idea how this one works. I set up the parameters to find files of a known type in a directory and it doesn't do squat. The is absolutely positively NO help in this one. Probably a really good idea, but maybe you just have to be a programmer to get it to work.